Help Nukanti build communities in 2018! Nukanti means ‘us’ in the Inga language of Colombia´s Amazonía region. Since 2009 we have worked to strengthen the social fabric in communities affected by conflict and poverty, using the arts & media, sports and education to engage and empower young people. But no one can build an ‘us’ alone, so this is the time of year when we rely on friends like you! For 2018 we’ve set an ambitious goal to raise USD 24,000 to help Colombia's youth build their own healthy communities. 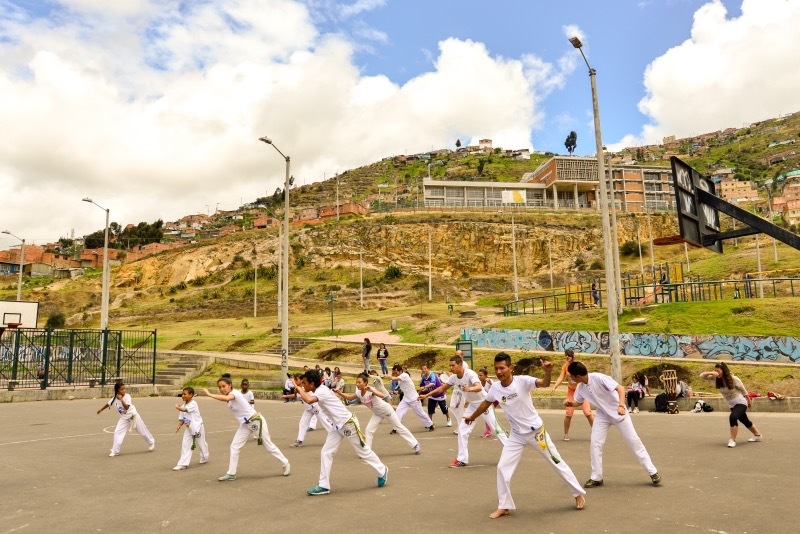 With as little as USD 30 you can sponsor a child to take part in our Capoeira program in Ciudad Bolivar, a shantytown on the outskirts of Bogota. In order to ensure the sustainability of the program we invite you to consider a donation of USD 60 for six months or USD 120 for a full year. Thus you will make it possible for children to benefit from our program all year round! With a one-time donation of USD 40 you will provide a child with a quality Capoeira uniform and thereby motivate it to give its best in every practice. We are all equal, we all wear white! Buy beautiful artisan products or a limited edition 'us' T-shirt at Nukanti Shop. Show the world that you support building a global community of us's! Join iGive for free. iGive allows social causes to generate funds through the online shopping of its members. Nukanti will receive a benefit just for new members who join through our link. Share our message with your networks via this e-mail, Facebook, or Twitter!